People will undoubtedly remember the Xbox 360 as the machine that got online gaming right. Gamers of tomorrow will talk about Gears of War rodeo runs, late night sessions of Firefight in Halo, and the time their console red ring of death’d just as they were about to get through Modern Warfare on Veteran. It is the console that brought the first person shooter to the consoling masses, stole Sony’s killers apps and for better or worse, achievement points. For me however, the Xbox 360 will always be the console on which I played Bastion. Released in 2011 by Supergiant Games, Bastion was an Action Role-Playing Game that featured a solid combat system, unique narration point and a stunning world that formed around the player’s very eyes. Bastion took the best of both Western and Japanese RPGs, put them in a blender and out came a dynamic combat system, an isometric perspective and enough charm to see it win and receive nominations for many coveted awards. Almost 3 years later, on May 20th 2014 Supergiant Games released their Sophomore effort, Transistor on Sony’s Playstation 4 and Steam. Would this be the arrival of a soon to be revered RPG? Transistor sees the player take the role of Red, a famous musician from the city of Cloudbank, who has been robbed of her voice by a mysterious organisation known as The Camerata. Armed with the eponymous Transistor, Red must fight her way through the city of Cloudbank, defeating The Camerata’s robotic forces known as The Process, in order to find answers and seek justice. The game’s narrative is however, somewhat of a fragmented mess. While a large chunk of the game’s story is narrated to the player by The Transistor, this will only reveal the surface of the game’s plot. To understand the game’s story to the fullest it allows you will require scouring the city of Cloudbank for Terminals, viewpoints and using the game’s combat mechanics to their fullest. While it can be argued that this really encourages exploration of both the game’s world and it’s possibilities of play, it may leave a player in search of more casual experience at a bit of a loss as to what is going on. Though what may frustrated the more dedicated player, is that even after putting in the extra time to discover these scraps of narrative, there are still some questions left unanswered or open to personal interpretation. This is not to say that the game does not have a story to tell however, and while Red herself is a slant on a stereotypical silent protagonist, the game is certainly heartfelt. The juxtaposition of a silence singer with a talking sword also offers an interesting dynamic, similar to the narrator in Bastion over it’s lead character, The Kid, meaning the game never slows down it’s pace for stories sake. As you would expect after Bastion, Transistor is a visual delight. The city of Cloudbank feels lived in because of the attention to detail in it’s visual design. Cloudbank is a Cyber-Punk utopia that at times seems to draw inspiration from Blade Runner’s futuristic Los Angeles and even Final Fantasy 7’s Midgar. Though this feeling of beauty comes with a cost. Despite it’s wonderful rendering, the level design feels slightly linear in it’s approach. While the game called out to be explored, there are not many reasons or options available to do so. Most of the more hidden terminals require simply trekking past an exit or just a little further around a corner, which while it scratches the itch for explorations that RPG players crave, it feels like a wasted opportunity. However, despite these shortcomings, Transistor’s combat system is a thing of beauty. Using ‘Functions’ the player is able to customise their fight style how they see fit. There are multiple melees, ranged and burst attacks, as well as Functions such as ‘Help()’ which allows you to call upon a dog to aid you in combat. While this may seem straightforward enough and one function be equipped to each of the shape buttons on the controller, the real depth begins to surface when the player unlocks the ability to upgrade other functions with functions, but also to have ‘passive’ functions active, which effect all of your arsenal. Suffice to say, that by the time new game plus roles around, Red is somewhat of God with the correct functions in place, which feels rather rewarding. Just like with the Narrative, there isn’t much explanation on the combat system, and Supergiant treat the gamer like an adult, letting them figure out these things for themselves, which adds a level of personal satisfaction in figuring out how to stack functions to the best effect. You are only limited by Red’s ‘Memory’, which act as her skill points for functions. These functions can be swapped in and out from the game’s numerous save points, meaning experimentation is encouraged as painlessly as possible. The combat itself can be customised further and either played like it’s predecessor in real time, or strategically with it’s ‘turn’ system, which allows you to plot the course of a turn like a strategy RPG, you can move around the battlefield, deal massive damage and avoid enemies, but as ‘turn’ suggests, you are left powerless until the turn bar refills. 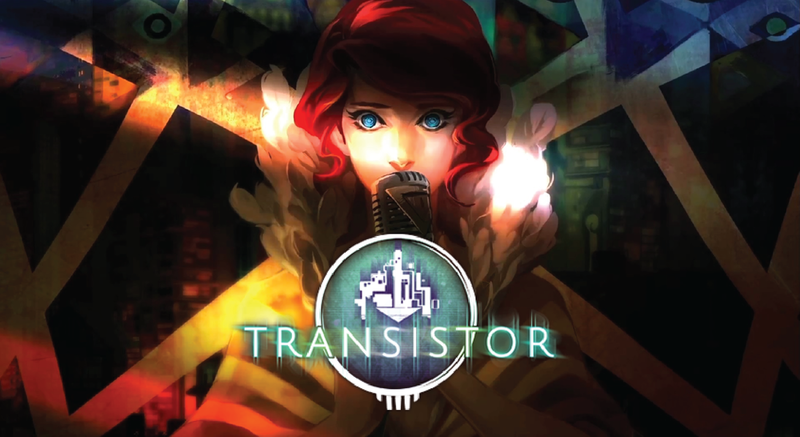 The ability to change this on the fly really helps to make Transistor an enjoyable experience, allowing you to change from aggressive to strategic at the press of the ‘R2’ button, without any hassle from menus or settings. Another winning aspect of Transistor’s combat is that when Red dies, the player is not presented with a game over screen, but simply loses on of the player’s functions for a limited amount of time, meaning the tables can still be turned, but with a less powerful arsenal, resulting in teaching the player caution and patience are the keys to succeeding. While enemies come in all shapes and sizes, all with unique functions and attack patterns of their own, there is a substantial degree of pallet swapping going on. While it’s perhaps not noticeable first time through, this means the enjoyment of the New Game + can be slightly hindered by a lack of variety in enemies, meaning the end game enemies spawn by the dozen rather than sparingly as they did on the first shot. It is also by mixing and matching these functions in various forms that more of the story is revelled to the player in a similar way to reading Dark Soul’s item descriptions, enriching the experience. There is also the option at any time to add a ‘limiter’ to the game, which acts similarly to Idols in Bastion. Equipping these limiters can do anything from limiting Red’s memory to making enemies hit twice as hard. Playing with all 10 activated might test your ability to play the game, but rest assured it will mean a lot of retries. Similar to Bastion’s Proving Grounds, there are also many tests the player can try to unlock music from the game’s excellent score. Away from the game’s main area, player’s can explore the practice test to hone your Functions as well as several to challenge you. The speed test to kill enemies within a time limit, Performance test’s your combat abilities with limited Functions, while Agency sees you face off against something else all together. Another of the game’s highlights is it’s score. Darren Korb and vocalist Ashley Barrett really make the game. Each number creates an ambience that sets the emotional tone for Transistor beat for beat, With such a rich variety of instrumental and vocal tracks, such as the launch trailer’s ‘All become One’, it will be fantastic to see what Korb achieves next time around. Barrett’s humming to this score creates not only creates a haunting atmosphere, but gives Red an emotional side that a voiceless protagonist would otherwise be lacking. Without speaking a line, Barrett allows Red to say more than words ever could. Transistor is solid game that asides from a few short comings, supersedes Bastion and many of the game’s spiritual predecessors. It’s innovative battles, beautiful visuals and simply breathtaking score are something any fan of Action RPGs should be clambering to experience. While more casual players may be put off by it’s seemingly sporadic storytelling, it’s important to know that it doesn’t detract from the fun of the game. While more experienced players may want to know going in, there are a lot of blanks to fill in themselves or on message boards. Overall, clocking in at around 5 hours for a single play-though, Transistor will leave you begging for more and perhaps a little emotionally engaged, which when considering the genre’s past, is perhaps more than we could have hoped for. But it’s a little sad knowing that with a pinch more narrative and a little more exploration to bring the game unto the bar raised by it’s combat, this game would be flawless. It will however leave you excited for the studio’s next title, and until then, I’ll see you in The Country. Newer PostTom + Mat Attack 054 – How Much! ?